Scenic Lake Vermilion is the fifth largest lake entirely in Minnesota. But its real uniqueness comes from its jagged shoreline that twists and turns and winnows to create the longest shoreline in the state. Visitors are drawn here for the wilderness-like North Woods beauty, the incredible fishing, the state park. And hopefully they will soon have another reason: a 40-mile paved regional trail. 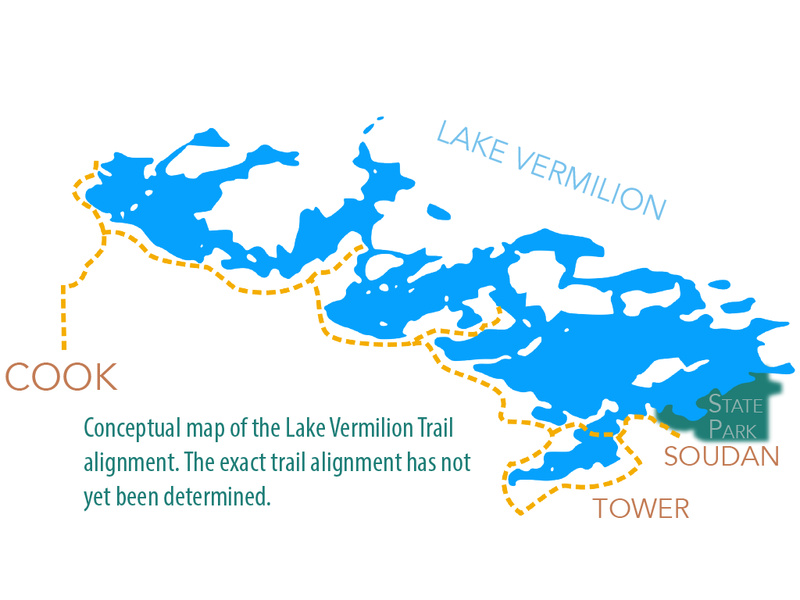 Volunteers have been working to build the Lake Vermilion Trail for years (see article on left for details), and if funding can be secured, segments of the trail may be on the ground by 2021. The trail will connect to the towns of Cook, Tower and Soudan. It will also connect to the Mesabi Regional Trail, which is a long-distance paved trail with a segment that runs through Lake Vermilion-Soudan Underground Mine State Park. Views of the lake will be prioritized when possible to make the trail highly scenic, possibly even featuring a bike ferry across Lake Vermilion’s Pike Bay. In addition to the lake, the trail will traverse peatlands with floating boardwalks, climb hilly glacial till uplands, skirt near bedrock cliffs, and cut through pine forests. Tourists will find the trail within a mile of 21 resorts, two motels, an RV Park and two campgrounds, and within three miles of an additional four resorts and a campgrounds. Permanent residents will benefit too. Currently, in much of the area residents are limited to walking and biking along the side of the road. Providing a safe route to access key sites such as the K-12 public school, Town Hall, the local store, and more is an important element of the plan. Volunteers and representatives from the many cities, townships and reservation of the Bois Forte Band of Chippewa, are diligently working to build the trail. Keep your eye open for progress the next time you visit.